JEFFERSON CITY, Mo. 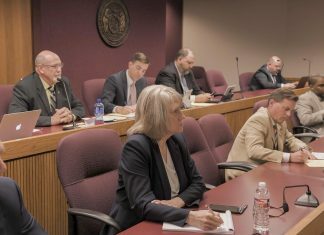 — The Missouri House of Representatives is no longer seeking the enforcement of a subpoena requiring the turning over of documents from A New Missouri. In May, lawmakers asked Cole County Circuit Court Judge Jon Beetem to enforce the subpoenas, which would have forced A New Missouri to turn over documents that they believed could demonstrate efforts between the nonprofit and former Missouri Governor Eric Greitens’ campaign to circumvent campaign disclosure laws. But following Greitens’ resignation, the attorney for both A New Missouri and Greitens for Missouri, Catherine Hanaway, argued that the investigation should be over as he had resigned, and that there was no need to enforce the subpoena. Beetem had sided with the House, ordering the nonprofit to comply, but had delayed enforcing the ruling to allow Hanaway the opportunity to argue for the dismissal. A hearing for both sides’ arguments was scheduled for 1 p.m. on Thursday, June 7, but the day before, it was announced that the special investigative committee had decided to ask the judge to dismiss its petition to enforce the subpoena. Beetem’s decision had allowed for information regarding donor identities to be redacted, but some were concerned that the House subpoena could lead to their identities being revealed. And with the House dropping the suit, Beetem has stated that the “matter is concluded.” The House does, however, reserve the right to refile at a later date, and Kempton says that the committee is reviewing its options in respect to obtaining the documents.